As Wolf says: “It is not hard to see why ordinary people, notably native-born men, are alienated. They are losers, at least relatively; they do not share equally in the gains. They feel used and abused. After the financial crisis and slow recovery in standards of living, they see elites as incompetent and predatory. The surprise is not that many are angry but that so many are not”. $300 million was spent on water and sanitation projects. centres opened for the disabled and elderly. a cap for landholdings to 993 acres per owner; around 200,000 peasants received title deeds as large land holdings were broken up. The BBC’s Latin American website, in considering Castro’s legacy states: “Undoubtedly, life for most Cubans on the island (and that means the vast majority who were poor when Castro came to power) improved dramatically under his leadership”. In his autobiography he said: “If people call me Christian, not from the standpoint of religion but from the standpoint of social vision, I declare that I am a Christian.” He was an exponent of the idea that Jesus Christ was a communist, citing the feeding of the 5,000 and the story of Jesus and the rich young man as evidence. In the early 1990s Castro embraced environmental concerns, campaigning against global warming and the waste of natural resources, and accusing the U.S. of being the world’s primary polluter. In 1994 a ministry dedicated to the environment was established, and new laws established in 1997 that promoted awareness of environmental issues throughout Cuba and stressed the sustainable use of natural resources. By 2006, Cuba was the world’s only nation which met the United Nations Development Programme’s definition of sustainable development, with an ecological footprint of less than 1.8 hectares per capita and a Human Development Index of over 0.8. Castro denounced the Third World debt problem, arguing that the Third World would never escape the debt that First World banks and governments imposed upon it and hosting international conferences on the world debt problem. In Somalia, Tanzania, Mozambique and Angola he was greeted as a hero for Cuba’s role in opposing apartheid South Africa and throughout much of Africa he was hailed as a friend to liberation from foreign dominance. Nelson Mandela’s first visit after leaving prison was to visit Castro in Havana to thank him for his support in the struggle against apartheid. He led the Non-Aligned Movement from 1979–83. In December 2014, he received the Chinese Confucius Peace Prize for seeking peaceful solutions to his nation’s conflict with the U.S. and for his post-retirement efforts to prevent nuclear war. 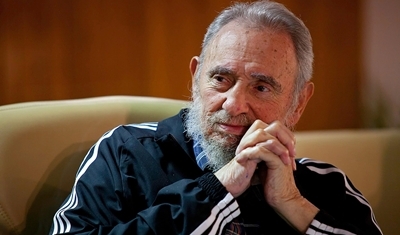 In January 2015, he publicly commented on the increased normalization between Cuba-U.S. relations, stating that it was a positive move for establishing peace in the region.